A humpback waves its tail to a group of whale watchers off Zamami. As surely as winter follows fall, humpback whales make their annual migration to waters off Okinawa and Kerama Islands creating an excellent chance for people to watch the giant mammals from boats off the Kerama Islands, near Naha. Several organizations and businesses organize tours see the majestic ocean species show off. The Zamami Whale Watching Association that organizes whale watching tours from Zamami Islands that have developed into a hub of the local whale watching industry keeps scouts who watch the whale’s annual migration from their observation post on Zamami Island. They reported spotting the first whale on Dec, 21st when a young male humpback whale was seen surfacing off Zamami. That means that the season is starting, and the first tours are about to go out already. Humpback whales, which come to Okinawa during the winter months, spend much of their year in the waters around Aleutian Islands off Alaska’s coast. Waters around the Keramas is where they come to breed and give birth. Males provide much of the entertainment to spectators as they form groups, called mating pods, to wage often fierce fights with each other as they vie for the females’ attention. Breeding runs in February and March, with births happening about a year later. The Kerama Islands are 25 miles west of Naha. The area was once a popular whaling ground until the whales disappeared from the area. Today, the Whale Watching Society is campaigning tirelessly to repopulate the area, and restore the region as a principal whale breeding ground. It appears to be working, as humpback whales make the annual trek to the Keramas to give birth to their young, and then nurture them in the warm waters. The whales travel about 3,200 miles to mate and breed here, then move back to the cold northern ocean waters in summer to feed. After the whale population was decimated, the hunting of humpbacks was banned in 1966 and their numbers started to increase. There are now about 80,000 humpbacks worldwide, down from about 125,000 of the pre-commercial whaling population. Whale watching tours depart two times a day from Chatan Fisherina, next to Hotel Hilton Resort Okinawa. The tours will start Jan. 7 and run through Mar. 31. Promoters of the tour virtually guarantee visitors will see whales. If none are sighted on a tour, the tour operator will give a free repeat trip to all customers. They put the odds at seeing them at 99 percent on either the first or second trip. The tour costs ¥4,400 for adults, ¥3,400 for kids 3 ~ 11, and ¥1,400 for those ages two and under. The price includes a ¥150 fee for Hamagawa Fishing Port use, and another ¥150 yen fee towards ocean cleanup efforts. The tours depart at 9:30 and 13:30. Participants should be at Chatan Fisherina at least 30 minutes before the scheduled tour. Tours that take about three hours can be booked on-line through Island Life Concierge. The Zamami Whale Watching Society is responsible for dozens of tours from now through April 5th. 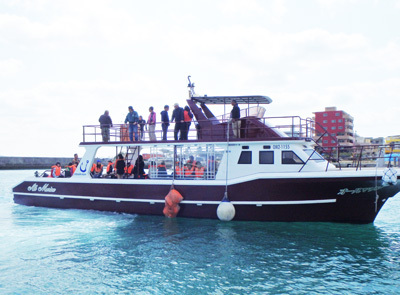 The society’s whale watching tours depart from Zamami Port. To get to Zamami, there are two daily ferries that depart from Tomari Port in Naha in time for the same-day whale watching tour. For detail information on schedules and costs, go to the Zamami Village Office Website. 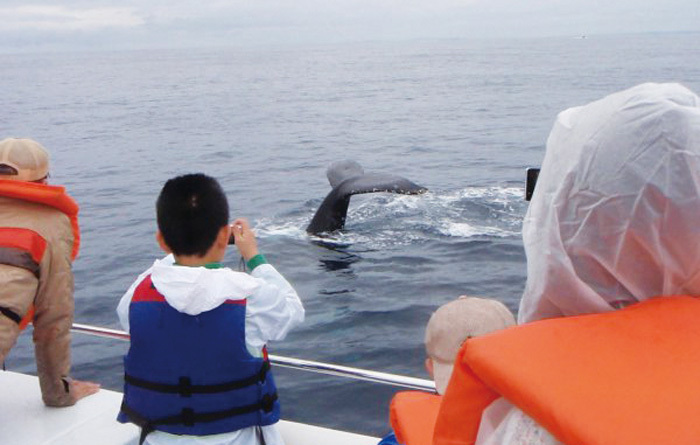 There’s a choice of watching for whales from a moving boat, or from the Whale Conservatory in Unazati on Zamami Island. Society members spot the whales in the area from the conservatory, and relay the location to the boats. Another shore site on Tokashiki Island to see the whales is the Okinawa National Youth Center atop Mt. Akama. The Center offers not only the view but inexpensive accommodations and more. Many tour agencies also offer whale watching tours.